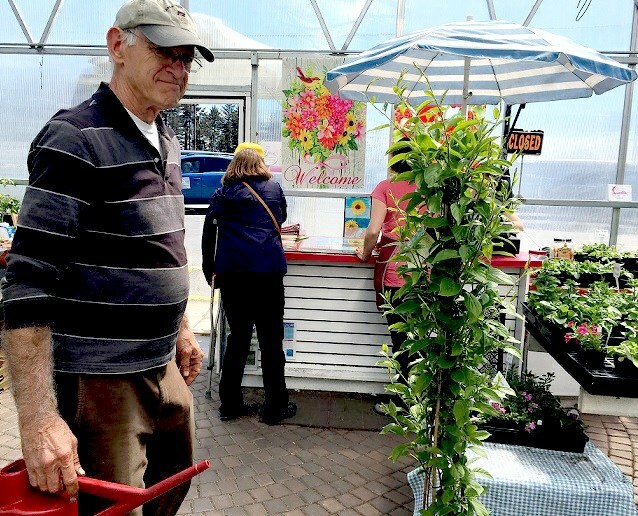 Summer is fast approaching, which means Kodiak gardeners are looking forward to crops of kale and other hardy greens – and also fruit. The last few years of warm weather means that more apples and even pears have popped up around town. On a sunny day this week, KMXT dropped by Strawberry Fields Nursery to check in with owner Lon White and see what the growing season had in store for the island. Customers catch up while the cashier rings up their purchases. It’s hot and a little humid inside the nursery. The flowers have bloomed, the herbs are ready for fostering and the vegetable plants come in many different promising shades of green. And just through the door back in the fresh air, a lady eyes a kiwi tree leaning against a wall. “And they stay alive outside?” she asked. Linda Suydam said she’s usually out fishing, but this year she’s sticking around for summer. So she’s looking into growing fruit — like cherries. “Lonnie, I wanna get that kiwi tree too,” Suydam said. Kodiak isn’t typically famed for its fruit, but trees line the walls outside the nursery. White points out the bees flying around, busy pollinating the trees. White said they’re also now selling pear trees, which locals have had luck with recently. “We’ve had such good weather in the spring and through the summer that it’s provided the heat that’s allowed people to successfully grow a lot more fruit than what we’ve seen in the past, so it’s kind of a new phenomena actually,” White said. White said good drainage, high quality soil, and lots of sun is vital to establishing fruit trees. As far as vegetables go, White said the garden season has just begun and rhubarb is the first arrival. He said lettuce, kale and chard will follow. But, White said with the aid of greenhouses, kale, lettuce, cucumbers, zucchini and soon enough, tomato plants will be ready for harvest.